Almost two years ago, in a trip that would be one of the last ones before I realised that Facebook wasn’t really all that good for sharing photos, my wife and I (although this is long enough ago that she wasn’t my wife at the time) took a stroll into Kingston, which ended up being a full-day, seven mile round trip along the Thames and through Hampton Court Gardens and Bushy Park (I mentioned this trip briefly in the opening preamble for Richmond Park in Autumn). 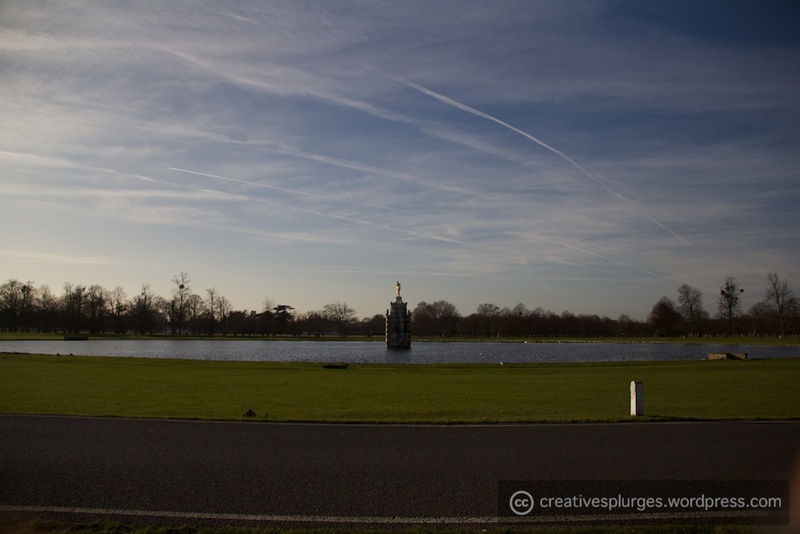 On the Friday before last, I decided to run a similar route, but in reverse; starting in Teddington I headed out through Bushy Park before crossing into the grounds of Hampton Court Palace on my way towards the Thames and Kingston. The original motivation for this trip was yet another new toy I had received the evening prior: a Canon EF 100mm f/2.8 Macro USM lens (oh how I love writing down accurate model numbers). This is a lens I’ve been wanting to buy since I got my 60D back in July, so when I got some cash at Xmas I used it toward buying it for myself. You can read a little more on the lens on my kit page. The original inspiration of the trip was some shots of flowers I’d taken the last time; I figured having another attempt at them with a macro lens would generate some interesting photos on such a sunny day. What I failed to take into account is that it is still winter, whereas the previous trip was in late spring. I also failed to take into account the photo opportunities I would encounter before I even got to where I expected the flowers to be. Before I go any further, I think it would be helpful if I gave you this. It might help you track my walk a little better. 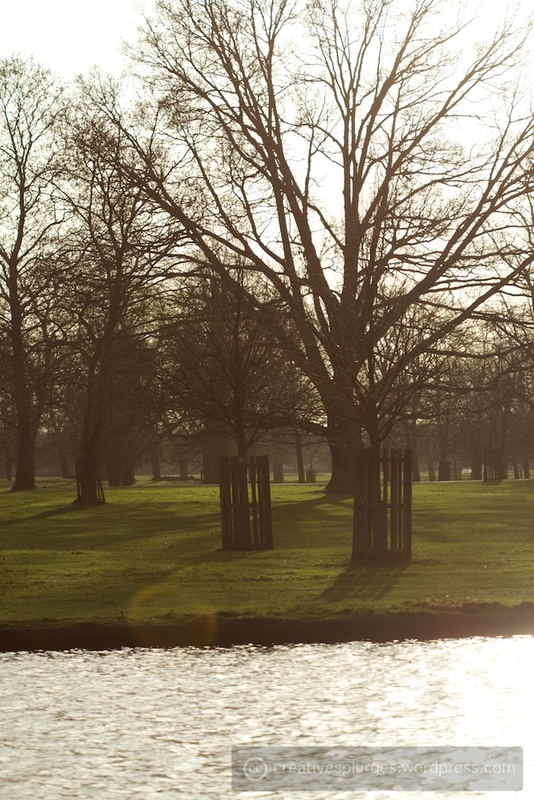 My route through Bushy Park saw me walking directly into the sun. Despite being not long past midday it was low in the sky, a reminder that the winter solstice was only a couple of weeks ago. Still, from the right angles it allowed some nice shadows and lighting. 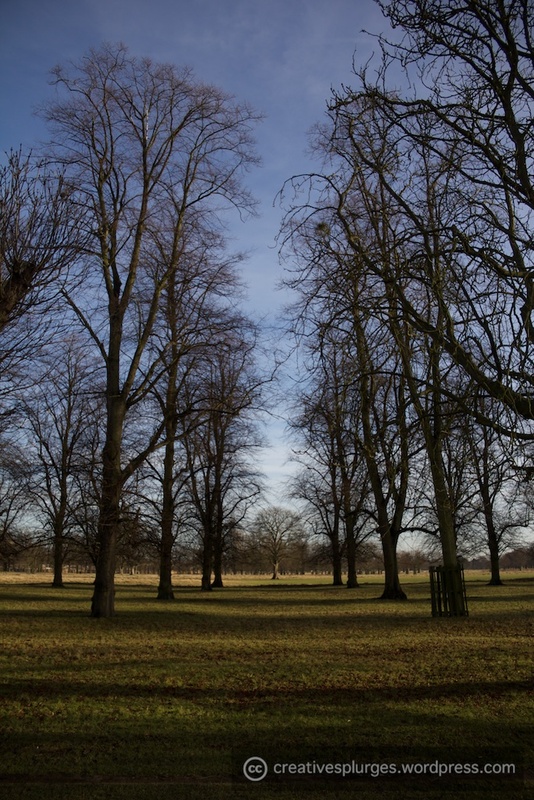 The trees in Bushy Park are all arranged in lines, meaning there are plenty of places you can get some lovely perspective shots. One of the best things about shooting at this time of year is the colours. 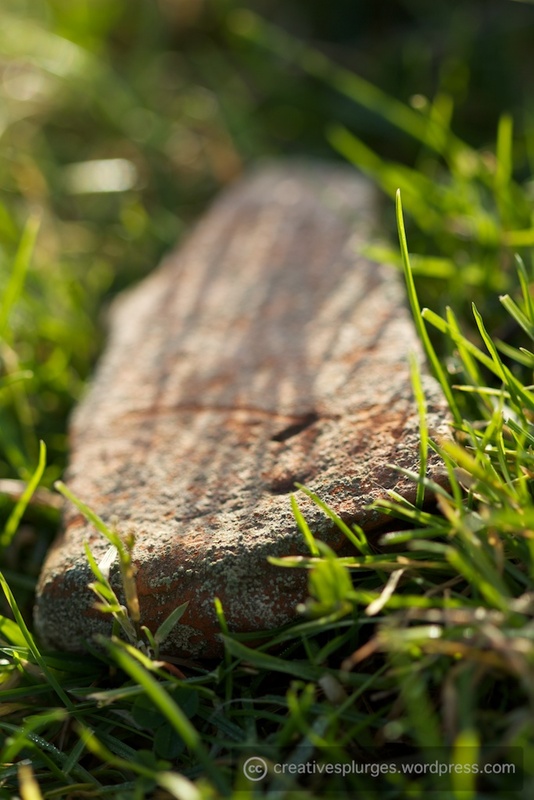 The sky can get a deep blue, the grass can be a solid green, and the browns of the trees is rarely stronger. However, when shooting into the sun, as is required for some angles I was trying to get, those colours bleach out a bit and clarity is lost. 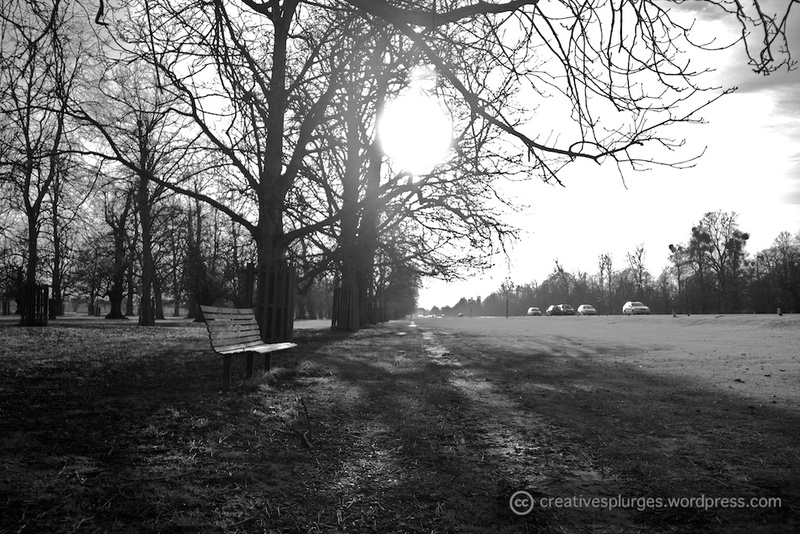 Hence, I have made more frequent use of black and white on this post than I usually would (although not quite to the level I did with my previous post). I really like the shadows in that image, although I think I may have overdone the highlight dimming a little amongst the tree branches. 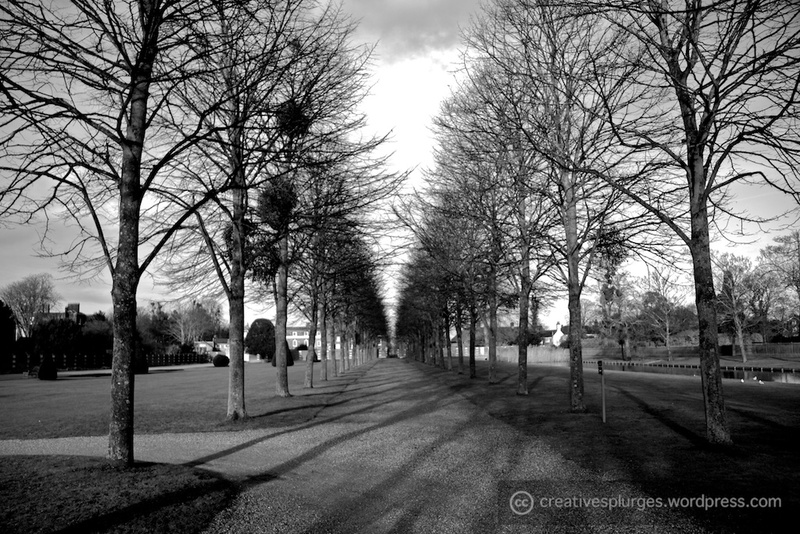 The lines of trees run in both directions in the park, both along the main road and perpendicular to it. 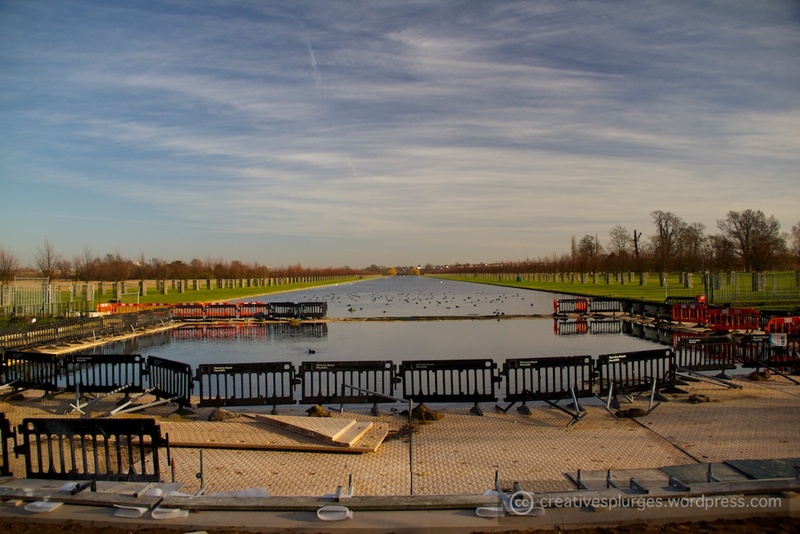 After walking half of the way from the Teddington entrance to the Diana Fountain, I turned around to see the route I had walked. 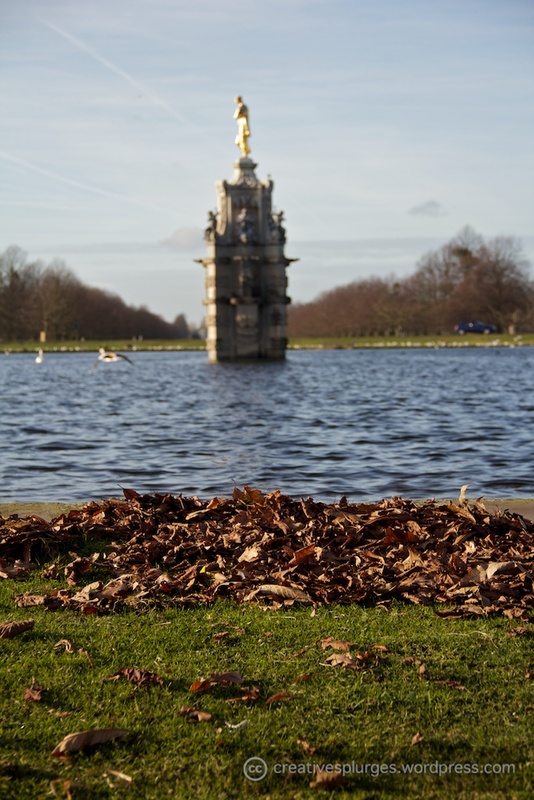 I really love the green, brown and blue of this image, especially the colour of the leaves on the ground. Presently I found myself at the Diana Fountain. 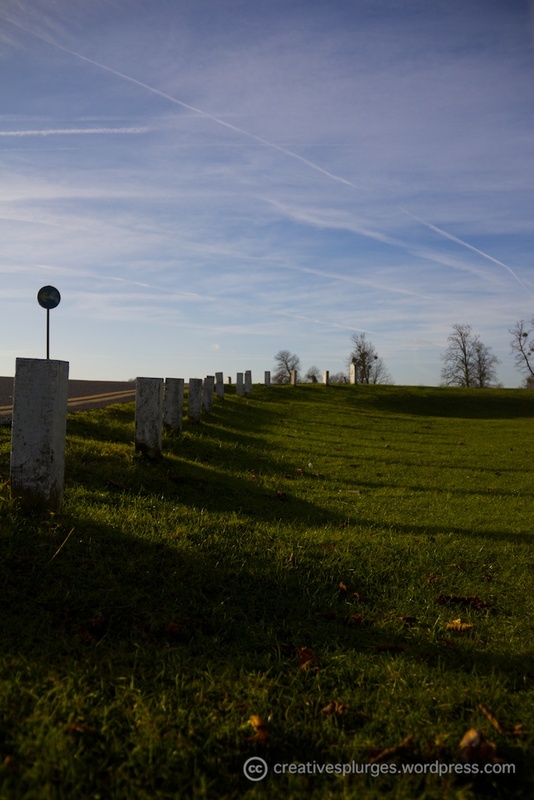 Just before I got there, I met the road, and tried a perspective shot of the posts marking periphery. 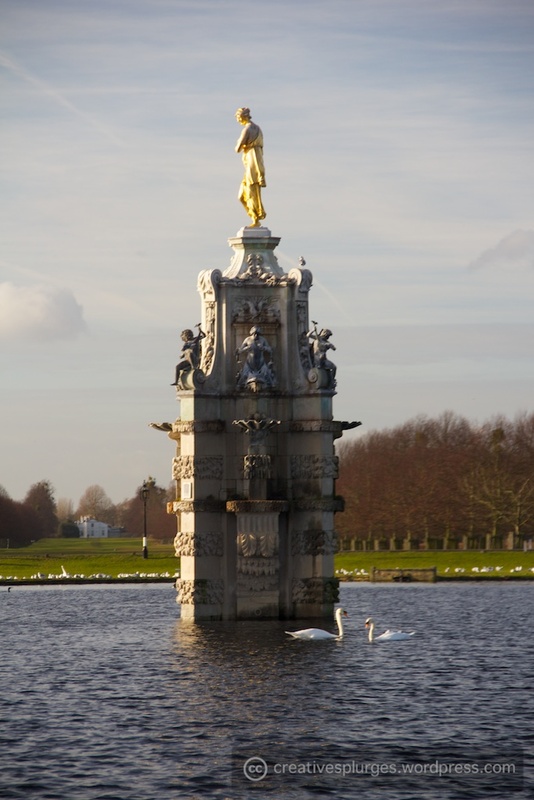 And then, the fountain – not currently fountaining, presumably due to the weather. It was at this point that I remembered that my 18-135mm ‘main’ lens still had a UV filter on it. Last time I tried to remove it, it was stuck. 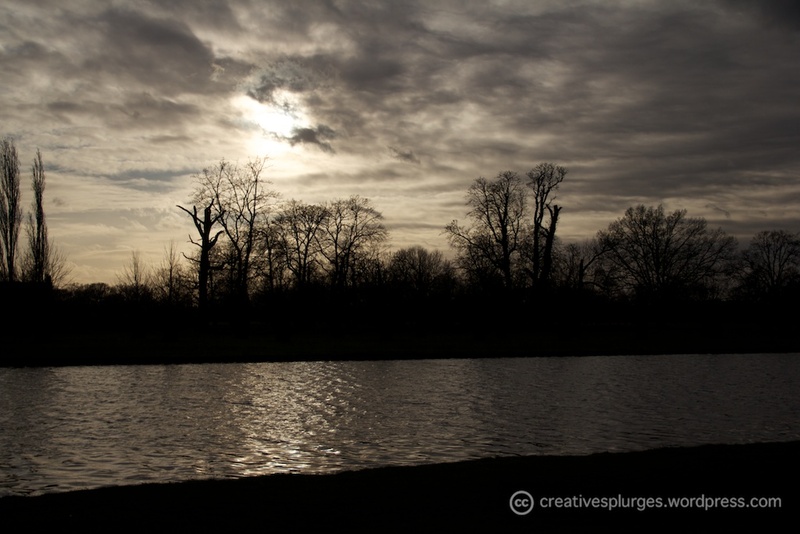 This time, I persisted, and managed to swap the UV filter for a polarising filter. The difference was immediately clear. This is an image inspired by another photograph, this time fellow blogger and photographer Scott Marshall, whose blog land-sea-sky iMAGEbANK is linked to the right. When I saw the colour of the leaves against the grass and the blue of the water, I couldn’t help but bear in mind an inspirationally colourful image Scott posted last week. Alas the colours in my own image above don’t ‘pop’ quite as much. 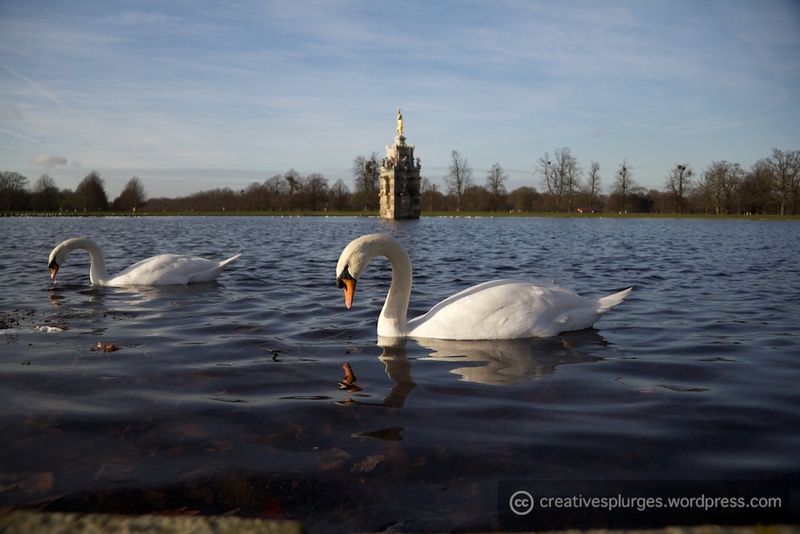 At this point I noticed the swans in the water, floating gracefully. 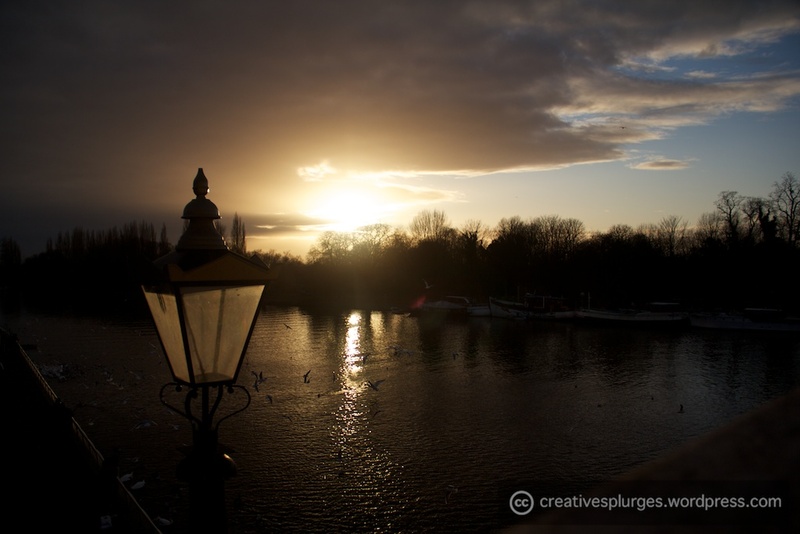 At this point I was still getting the hang of the polarising filter. One of my big problems when I’m out shooting is forgetting things. I know about ISO, aperture, shutter speed, polarising filters, HDR and the likes, but more often than not I forget about it when I’m out in the field. It does happen that I get home to process my images and see one that could have been so much better if I’d remembered a technical detail whilst actually shooting. So it was little surprise then that I would occasionally forget that rotating the polarising filter through ninety degrees has a different effect on the image. Quite unusually on this occasion, however, I actually remembered, and twisted the filter round to see what I got. 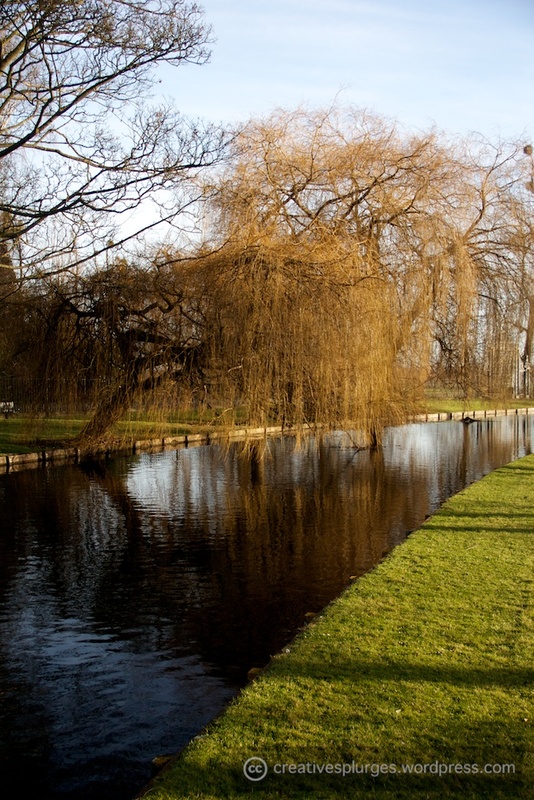 Maybe it was the light (as I was now shooting with the sun behind me, rather than beside me), but the grass definitely seems greener, and the water bluer. I also like the results gotten from shooting at such a low angle. 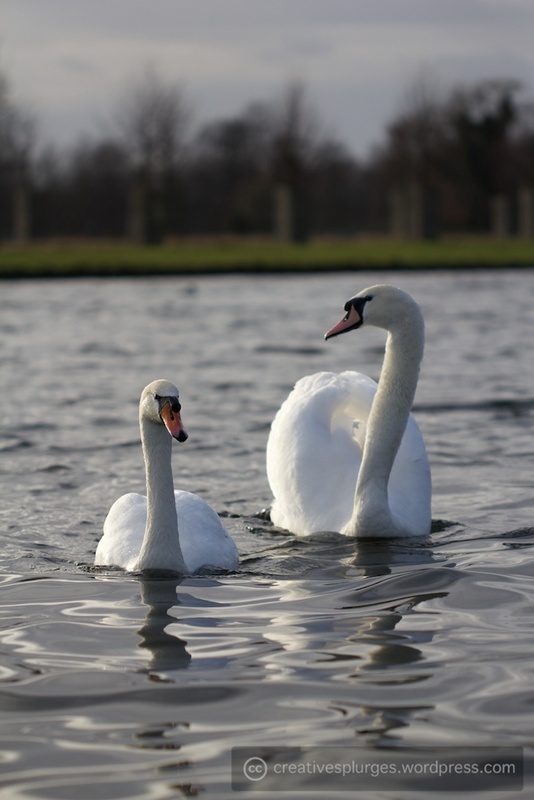 The result got better as the swans got closer. 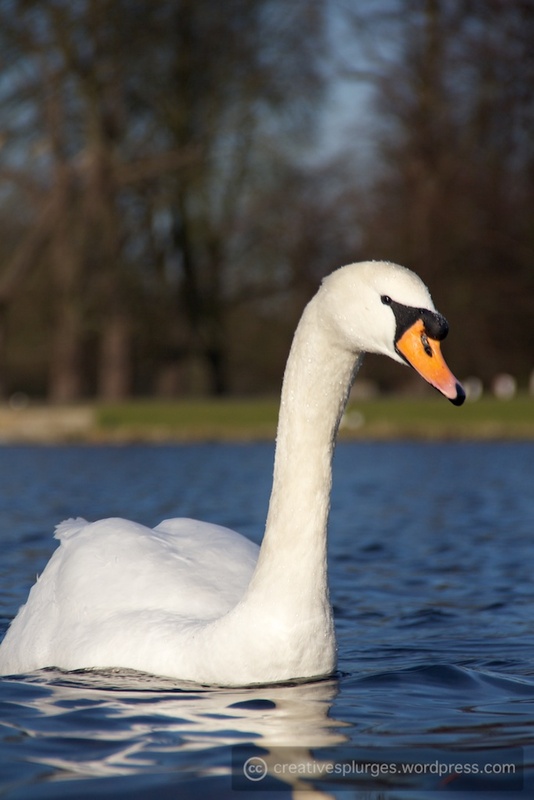 At this point the swans swam right past where I was, allowing me to take one of my favourite photos of this batch. 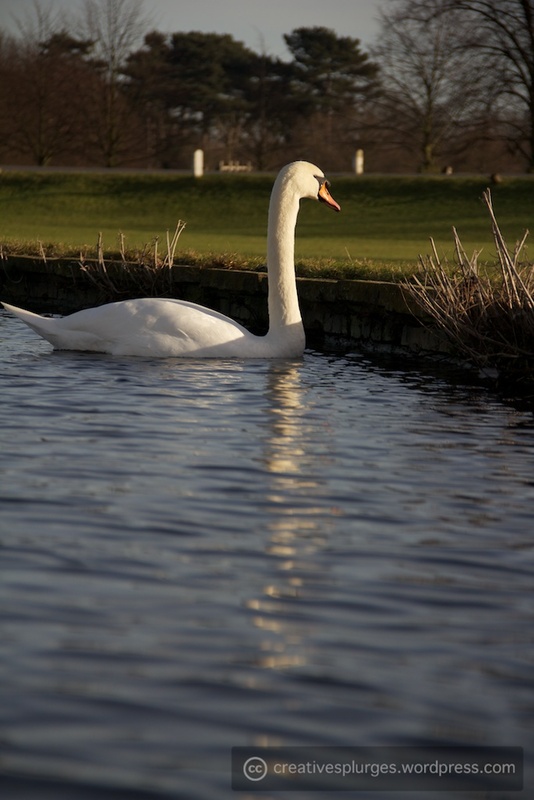 After that, I took one more low-level shot of a swan basking in the sun, before I continued my journey out of Bushy Park. 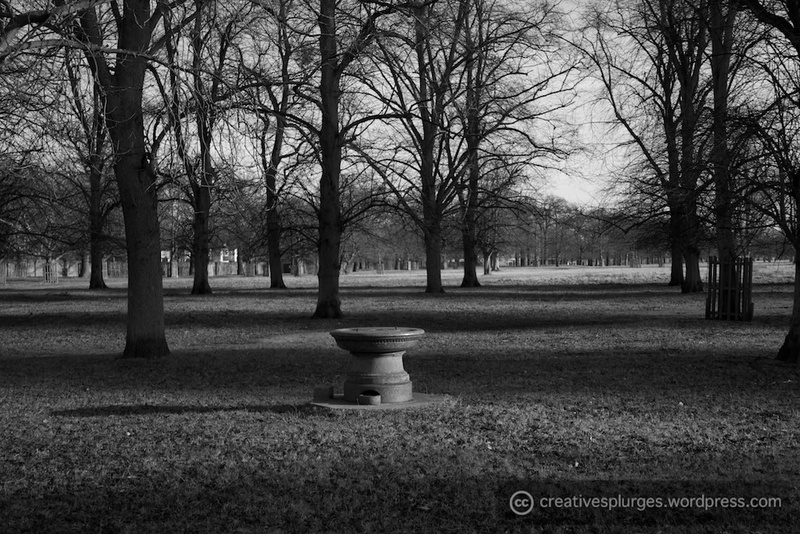 Once I had exited Bushy Park and crossed into Hampton Court Palace Gardens, I found myself in familiar photographic territory. 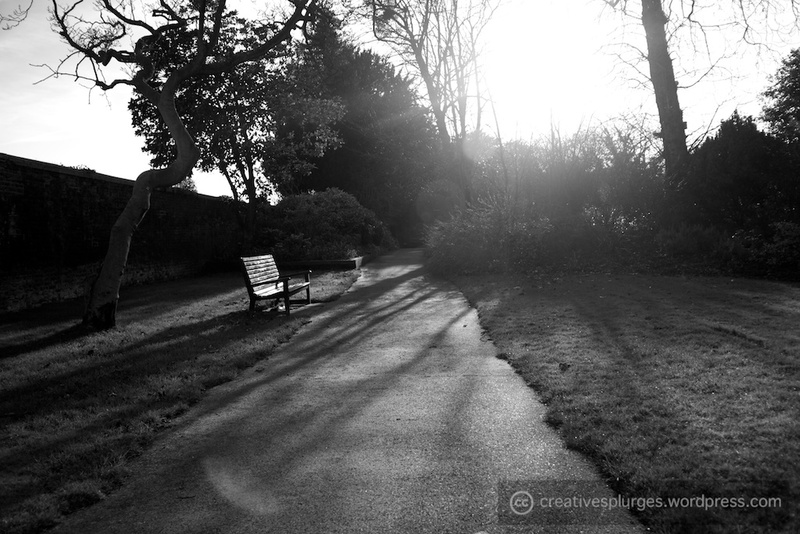 That is the first image I’ve turned monochrome that was taken with a polarising filter. I don’t know if it’s just me, but it seems a little crisper than the similar shot above. As I continued into the gardens, I walked past an empty ticket booth into what might possibly have been an area I needed to pay to get into. I honestly don’t know on that front, I wandered around for a good quarter of an hour without being chastised at any point, so let’s assume I wasn’t technically trespassing. 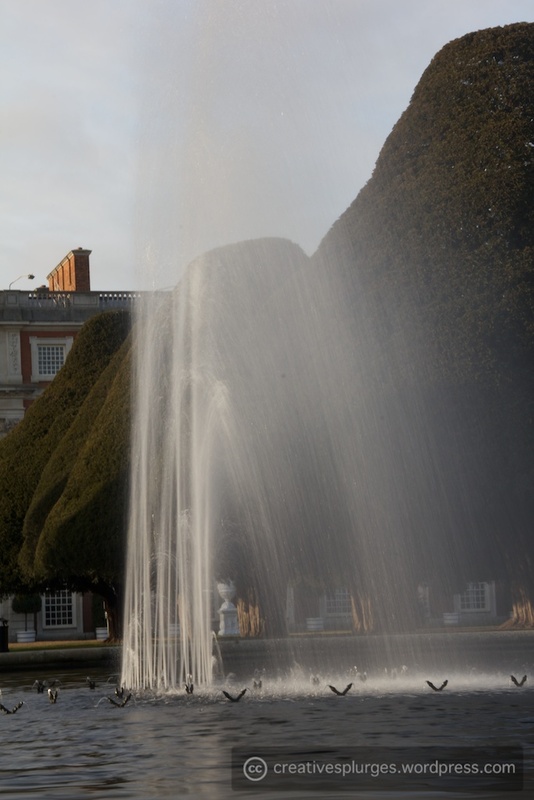 The grounds of Hampton Court Palace were stunning, although there did seem to be some renovation work going on and many of the statues were wrapped in protective plastic. Even the Long Water was a little interrupted. 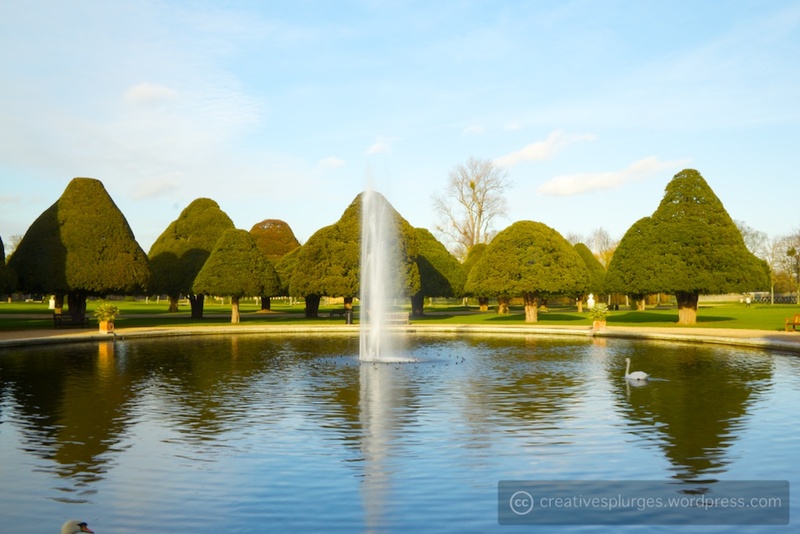 Despite that, as the Long Water curls around the actual gardens, there were some views to be had. 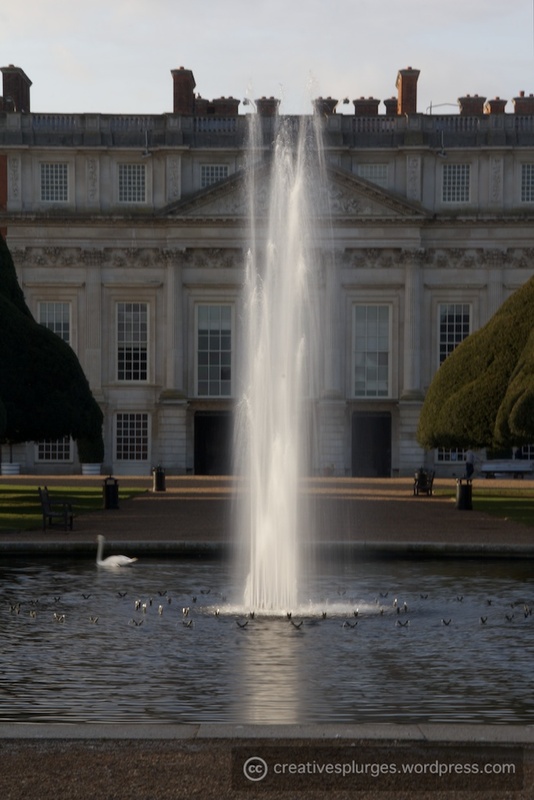 The highlight of the gardens – apart from trees trimmed to look like something out of Alice in Wonderland – was the fountain in front of the palace. 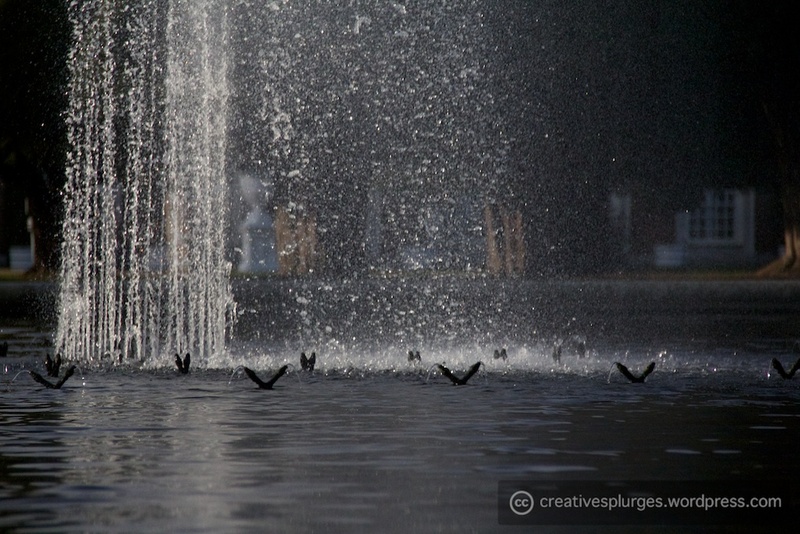 Now, it wouldn’t be me if I didn’t try mucking about with shutter speeds when faced with a water feature. Naturally, I also tried the other extreme. I don’t know if it was my focus or some other setting, but the water droplets aren’t quite as sharp as I would have liked them to be. So, I returned to trying to get better results with the slow shutter. Despite having identical settings to the previous slow shutter shot, save for the focal length, the water seems a lot more blurred than last time. 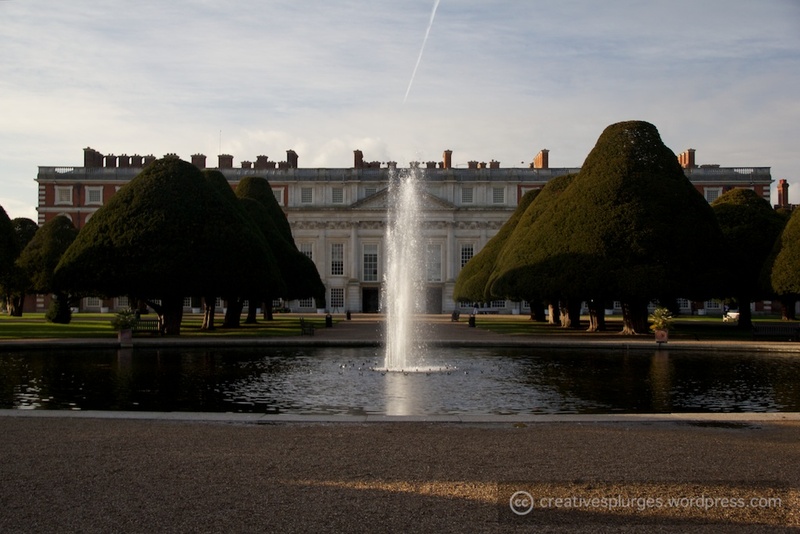 I also tried a wider shot of the pond in general, with more of the trees and less of the palace. There are actually quite a few adjustments to this photo to make it look like this. It’s been cropped, straightened, colour balanced and had the saturation upped a bit. In the old days, the old days being about a year ago, I would usually have to make at least of one these sorts of adjustments to my images (usually an exposure correction, which funnily enough wasn’t needed on this photo). Recently I’ve needed far less tweaking to images, based in part on a more conscious awareness of exposure bias and relying (perhaps too heavily) on the camera’s auto white balance. The most common correction I find myself needing to do these days is correcting my 18-135mm’s tendency for chromatic aberration at either end of its focal range. 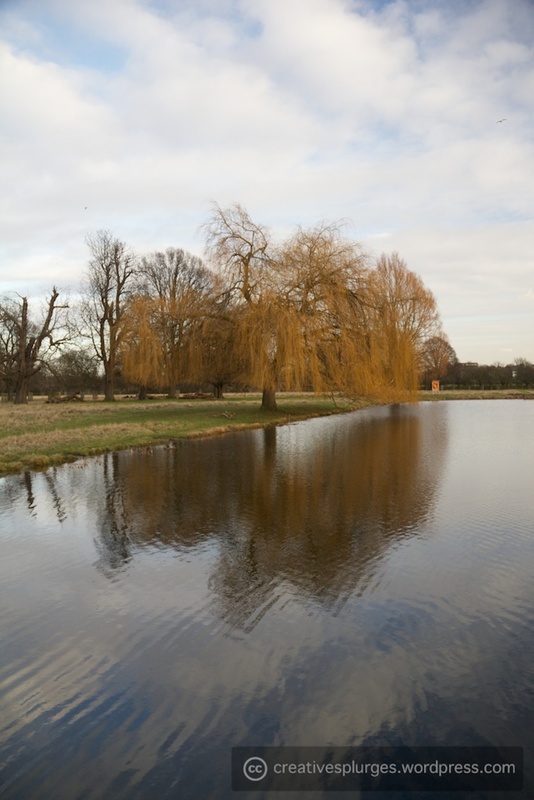 After this I left the gardens to trek along the length of the Long Water towards the Thames. When I arrived, it occurred to me that for a trip motivated by my new lens, it hadn’t even come out of my bag on this trip yet, and I was going to use it, dammit! So, I snapped it on, and began following the Water. Admittedly, it is a bit hard to get a sense of scale in this image. I can’t actually remember how close this was to the camera, but the width of this photo is roughly an inch or two. I really love the bokeh that this lens can produce (bokeh being the quality of the blurry bits, one of those fantastic little words that is used to describe something you didn’t realise somebody felt was important enough to come up with a word for). 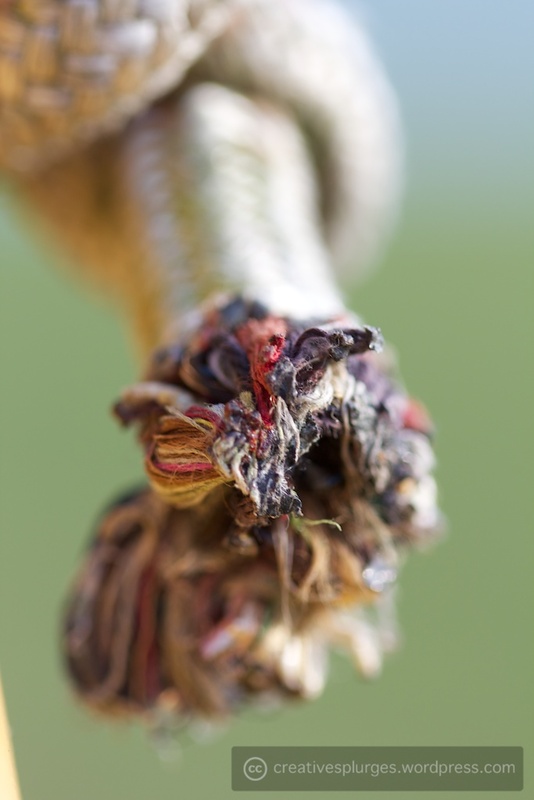 As this is a macro lens, the narrow depth of field caused by the big aperture equates to a few millimetres in reality. 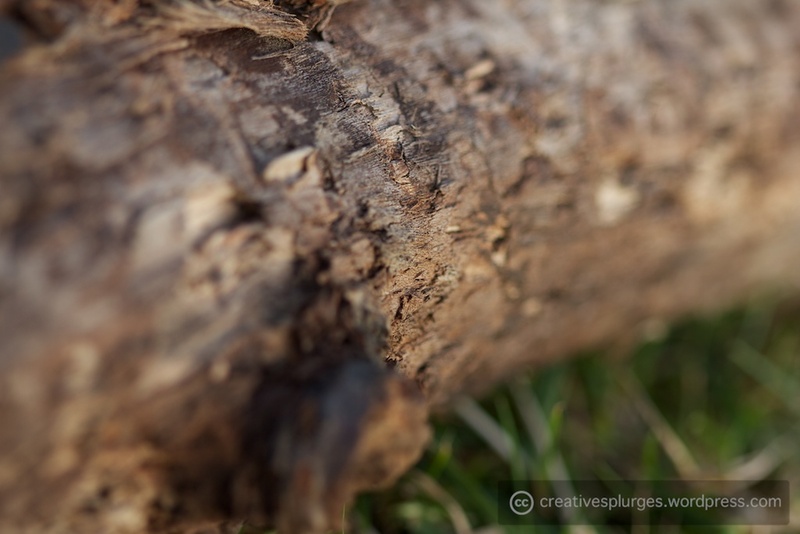 This is a stick of reasonable size – probably a similar sort of width as the stone above – the clarity of the in-focus portion is offset against the creamy bokeh. Mmmm, creamy bokeh. Whilst I was occupying myself photographing the little things on the grass, the sun was working its way towards the horizon. I actually quite like the effect gotten from pointing this lens into the sun; there’s an almost sepia-like quality to the resulting images. As the light continued to develop, I couldn’t resist any more, and quickly swapped out for my wider angle lens to get a better shot of the sky that was forming. 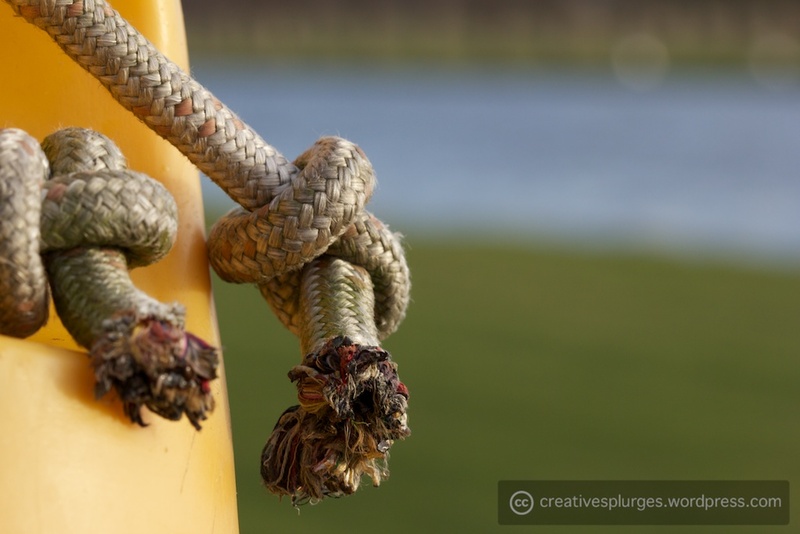 I swapped straight back to the macro lens, and soon found a life ring, which had some colourful frayed rope. I then attempted to widen the depth of field to get a little more clarity. 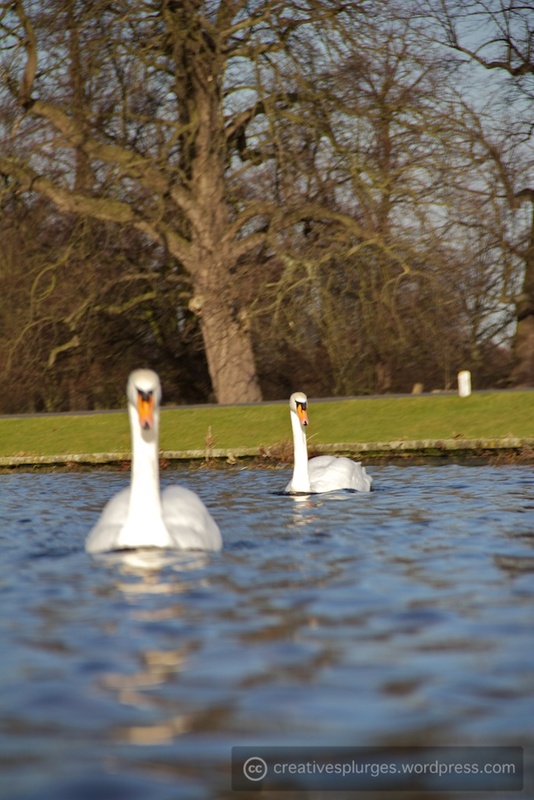 After that I turned my camera back towards the swans. I really like how this lens behaves at longer distances. Part of the reason I bought it was positive reviews of its performance as a more general lens, and it didn’t disappoint. However, I was keen to try it at the extremes of its macro capability. I found a daisy on the ground, and got as close as I could. Shooting at this range was weird, I set the focus wheel to its closest setting, and literally moved the camera back and forth a little until the right bit was in focus. 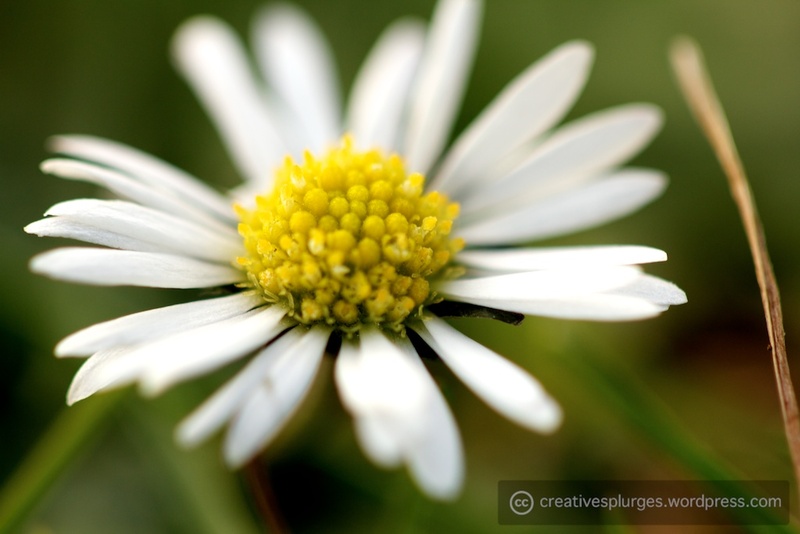 You can see also how narrow the depth field is with the maximum aperture – this daisy is less than two centimetres wide, and it fills the frame; the in-focus portion of the flower is a couple of millimetres wide at most. That said, it is still difficult to comprehend the scale without a reference. 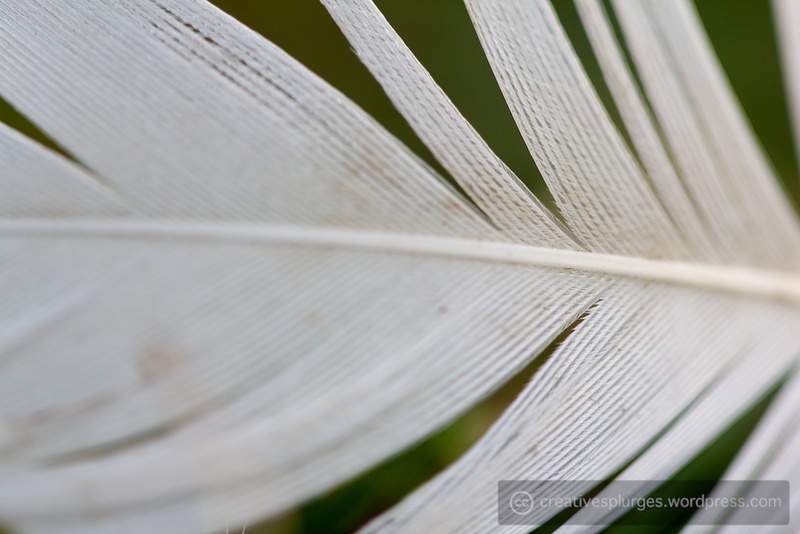 Likewise, with this closeup of a feather it is hard to fathom how big – or rather, how small – it is. 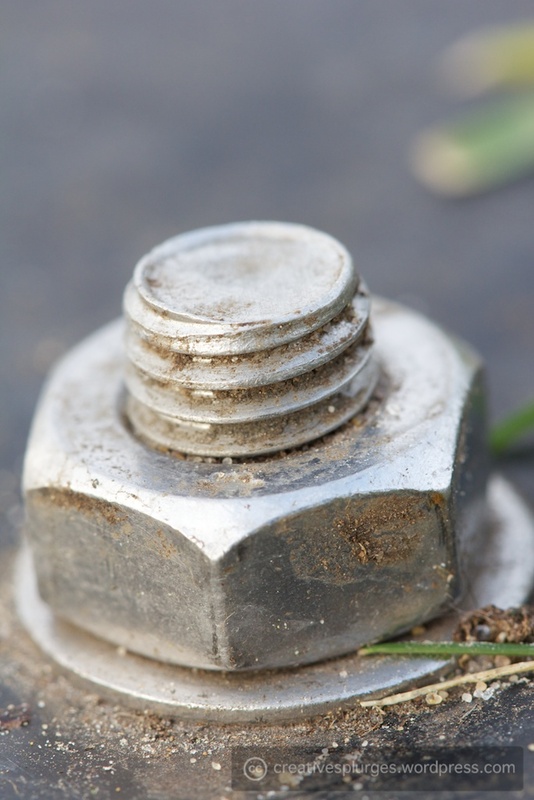 As I reached the end of the Long Water, I found a metal plate that had been bolted down with reasonable-sized bolts. Worth a shot. 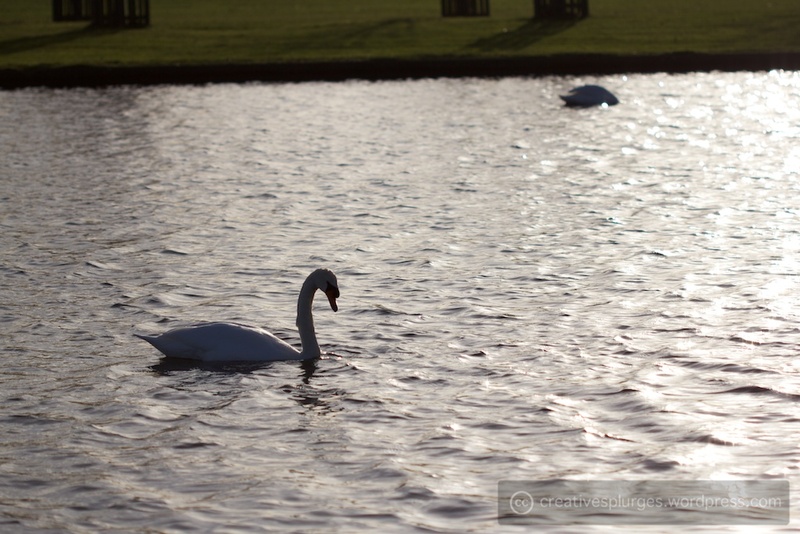 I closed up the aperture a little for that photo; in my first attempt the depth of field was a little too shallow. 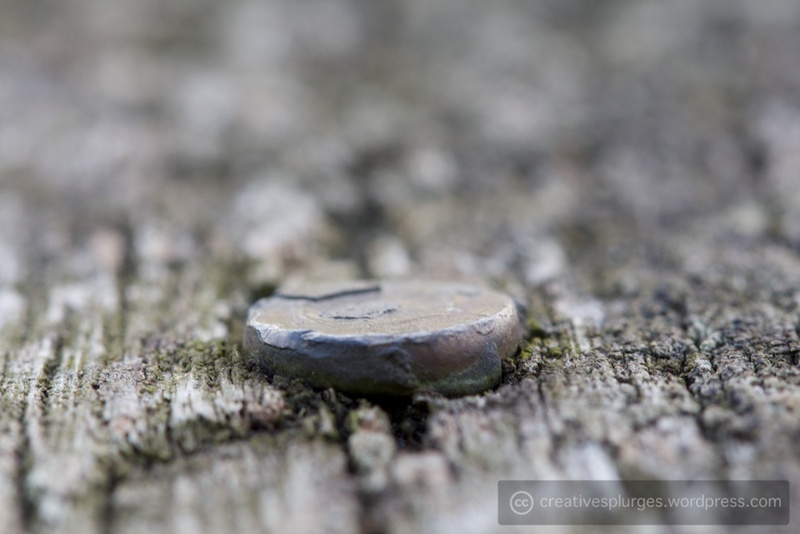 I then came along a bench, made of old, well-weathered wood, held together with a few nails. Despite the (admittedly only very slightly) narrower aperture the depth of field is still very thin – I can only image how much thinner it may have gotten if I’d opened it up all the way. I do like that the focus extends for most of the diameter of the nail and no more than that, but I do think that perhaps the out-of-focus portion of the image is allowed to dominate and gets a bit too out of focus towards the top of the frame. At this point the sun was getting even closer to the horizon, so I swapped out the macro lens for my wider angle to start capturing more of the scenery. 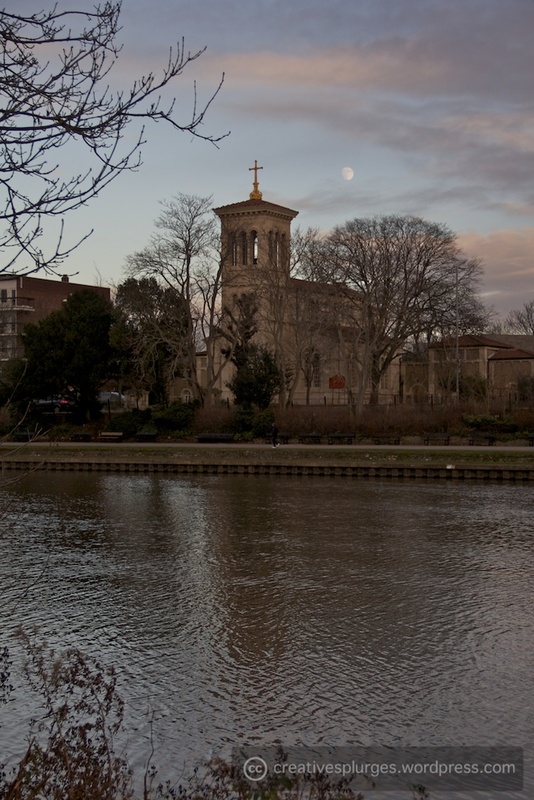 As I made it back out onto the Thames, the Moon had risen above the buildings, and combined with the low sun the lighting made for some impressive views. After that, I crossed over Kingston Bridge in order to get some lunch, as I had been walking for most of the day and hadn’t actually eaten yet – save for a little bit of leftover Xmas chocolate. As I turned back towards where I had just come from, I saw that the day had closed with a lovely sunset. 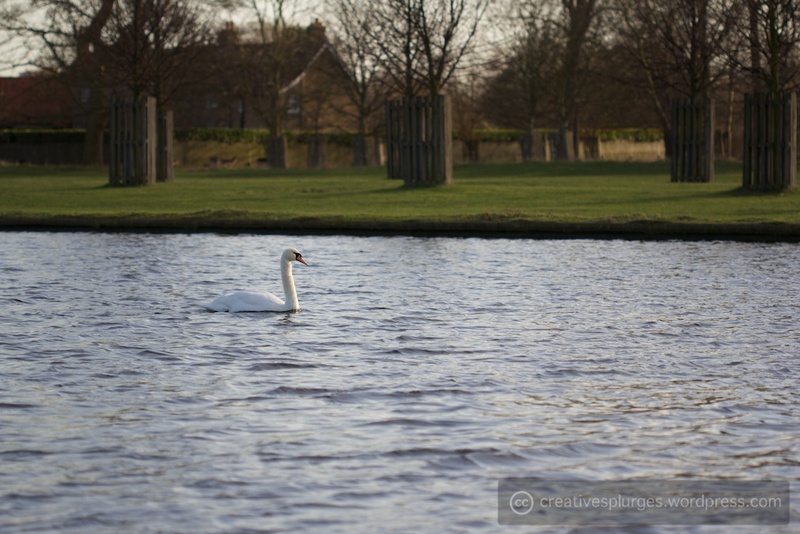 For what started out as a trip to try out my new lens, it is a little ironic that I spent most of the time trying new things with my oldest lens and a polarising filter I’ve had for months but never got round to using. I’m actually very pleased with the results I got from both lenses; there’s definitely no buyer’s remorse on the macro lens. 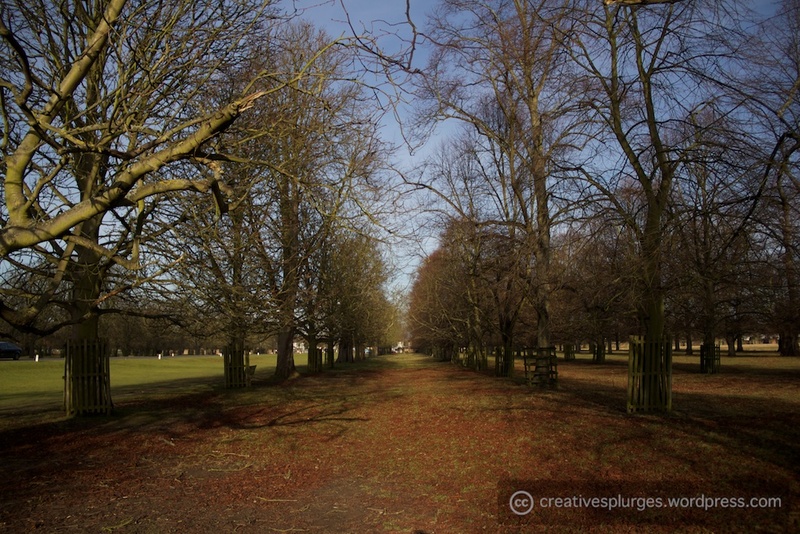 Hopefully as spring blooms and flowers and insects come out to play I’ll get some interesting subjects to photograph. Sorry this has been such a long post; rest assured the time taken for you to read it is nothing compared to the time it’s taken me to write it. If you’ve made it this far, thank you, and congratulations.